Some artists seem to have no limits to their talent whatsoever. When Lucette Bourdin released her magnum opus Silver Moon in February of 2009, we at Earth Mantra were so blown away by it that we could not conceive of how she could possibly top herself. Surely, we thought, this is the pinnacle of Lucette Bourdin's music. Then just a few months later, Lucette asked us to release the sequel to Silver Moon, aptly entitled Golden Sun. A short time after listening to it, we picked ourselves back up off the floor. Folks, we don't know how she did it, but she has topped herself again. Golden Sun is a two-disc cornucopia of some of the driftiest, loveliest, and most elegant ambient music we have ever heard. Everything there is to love about light ambient music can be heard in this jaw-dropping release, from sweet and subtle ambient washes to clever electronic pulsations, from mesmerizing shamanic sound sculptures to soaring melodic lines. An amazing breadth of music, performed beautifully, and captured in an immaculate recording. If that weren't enough, Lucette's beautiful artwork also adorns this release. Is there anything she cannot do? We at Earth Mantra listen to a lot of ambient music, and are familiar with the works of thousands of artists at all levels of success and accomplishment. 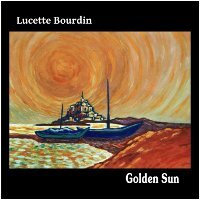 You'll have to trust us when we say there are very few artists, today or at any time, who have had both the sheer ambient chops and the sublime musical taste of Lucette Bourdin. She is clearly one of the best ambient artists active today, and we are ecstatic that she continues to release her breathtaking music through Earth Mantra. In the notes for Silver Moon, we said that it was "sure to be one of the top releases of 2009". We'll go one better with Golden Sun and say this is quite possibly THE top release of 2009. Nothing less than music for the ages. thanks for uploading this beautiful artist :) BIG THANKS! I am searching for rising fog album. do you know if i can find it anywhere? thanks! It is wonderful album. One of the best on EarthMantra and one of the best I have ever heard. Thank you Lucette for this beautiful music. This is inspiring!